Nearly a year ago, the Tampa Bay Buccaneers hit the reset button on the franchise. Sitting at 2-13, it is clear the Bucs failed to capitalize on their fresh start and must once again look to free agency to begin anew next season. Lovie Smith pledged another aggressive offseason in free agency, per Pewter Report. As it stands, the Bucs will have $24.9 million in projected 2015 cap space, according to Over the Cap. Though the team's performance might warrant a wholesale liquidation of the roster, free agent or not, the Bucs do need to consider bringing back some of their unrestricted free agents. The biggest question facing Tampa Bay is whether to re-sign middle linebacker Mason Foster. Since the Bucs drafted him in 2011, Foster has been a fixture in the middle of the Bucs defense, for better or worse. Foster has never been strong in coverage, a necessity for a middle linebacker in the Tampa 2 defensive scheme Lovie Smith runs. Nonetheless, his presence evidently gives both the run and pass defenses a much-needed boost. Despite the emergence of the versatile LB Danny Lansanah, the Bucs should bring Foster back next season. His leadership and physicality are elements the Bucs defense sorely needs. The rest of the Bucs' 2011 draft class has not proved to be as indispensable. Defensive ends Adrian Clayborn and Da'Quan Bowers were taken in the first two rounds in 2011, but neither made much of an impact since joining the Bucs. Clayborn hasn't been an effective pass-rusher since his rookie year. His durability is glaring problem as he missed two seasons due to knee and biceps injuries. When the Bucs elected not to exercise the fifth-year option on Clayborn's contract, it looked as though his time in Tampa Bay was coming to an end. Clayborn and Bowers may be worth bringing back on prove-it deals. According to JoeBucsFan.com, Clayborn is already cleared to play and impressed coaches with his work ethic and team-oriented attitude during the preseason and his time on injured reserve. Bowers would have to be on a short leash to return to Tampa Bay next season. Most importantly, he would have to arrive at training camp in good enough shape to practice without injury. At the beginning of the year, the notion of tight end Luke Stocker staying on the Bucs roster through this season might have been crazy. Instead, Stocker had his best season yet, finding a niche as a potent lead-blocker. The one free agent the Bucs must absolutely cut ties with is offensive lineman Oniel Cousins. The former Cleveland Brown is nothing short of a liability on the field, no matter what position he plays. Keeping him on the roster would signal to the free-agent market that the Bucs are incapable of self-scouting. The fact that Cousins saw significant playing time this season is emblematic of why the Bucs need yet another overhaul of their offensive line. This time, they have to actually address their holes at the guard position. The Bucs need at least another starting guard with the possibility of a second starting guard and a right tackle. The top two names the Bucs should target this offseason are Denver G Orlando Franklin and Cincinnati G Clint Boling. Both are unrestricted free agents after this season, and barring their current teams re-signing them, they would be strong additions to the middle of the Bucs line. Franklin started for Denver as a rookie and came into his own during his sophomore season, excelling in both pass- and run-blocking. It would be a little surprising to see Franklin walk away from Denver, but if he does, he would be the best guard on the market. Bucs fans may be apprehensive about signing another former Cincinnati lineman. However, unlike Bucs left tackle Anthony Collins, three-year starter Clint Boling has more than half a season under his belt. He isn't quite as solid as Franklin but may be a more realistic option for the Bucs. Signing Franklin or Boling would shore up one guard position, but the other guard spot is marred by uncertainty. Logan Mankins is a viable starter at left guard, but he is due to earn $7 million next season, none of which is guaranteed, per Over the Cap. The Bucs may cut ties with the former New England Patriot to clear cap space. The Bucs also have to figure out what to do with Collins. The former Bengal missed three games this season due to injury and sat on the bench the last two games on account of "a coach's decision," per the Tampa Bay Times' Greg Auman, while Demar Dotson replaced him at left tackle. When he was on the field, Collins was subpar in pass protection. He is among the worst on the team in committing penalties, credited with nine in 10 games, per NFL Penalty Tracker. Half of Collins' $6 million salary next season is guaranteed, according to Over the Cap. Cutting him would be a wash for salary-cap purposes. On his radio show this week, Lovie Smith offered Demar Dotson's move to left tackle as a reason for hope next season. With Dotson's reassignment appearing permanent and Collins on the outs, the Bucs need a new right tackle. The Bucs should keep a close eye on Dallas this offseason as right tackles Doug Free and Jermey Parnell are both unrestricted free agents. Both played well on a line that kept Tony Romo upright and facilitated the NFL's second-best running attack. However, the Bucs should be careful not to pay too much for either player. There is a flip side to both players performing well on the same line at the same spot. This may be a case of the whole being greater than the sum of its parts, and the Bucs could end up with another Anthony Collins. The last position where the Bucs need to consider free-agent help is safety. Given what Tampa Bay is already paying to man its backfield, it can't hurt to spend a little more to upgrade. The Bucs already dropped serious coin on former San Francisco 49ers safety Dashon Goldson by signing him to a five-year, $41.25 million contract in 2013. While Goldson hasn't been a total bust, he was grossly overpaid by former Bucs general manager Mark Dominik. As with Collins, cutting Goldson won't save any cap space in 2015, as half of Goldson's $8 million salary is guaranteed, per Over the Cap. 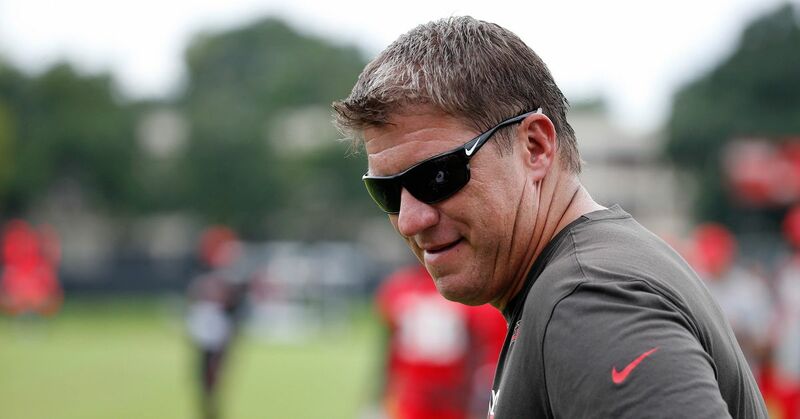 Long term, the Bucs will save $22 million and can sooner integrate a safety to better fit Lovie Smith's defense. One free agent the Bucs must consider is New England S Devin McCourty. One of the best cover safeties in the NFL, McCourty would provide a tremendous upgrade to the Bucs' 26th-ranked passing defense. McCourty is one of those players the Patriots won't want to lose, but they may not have a choice. New England is currently $1 million over the projected 2015 salary cap, according to Over the Cap. The average annual salary of the top 10 highest-paid safeties in the NFL is $7.9 million, per Over the Cap. Even with the roster cuts, it's unlikely the Patriots will be able to find enough cap space to pay McCourty like the top-10 safety that he is. The Bucs won't have that problem. If the Bucs learned anything from this season, it should be that big spending in free agency is no guarantee of success (and may even impede it). Lovie Smith seems poised to drop more money next year, but only time will tell if he's only throwing it away once again.